Andria Dadiani (Mingrelski) (1850-1910) was Prince of Samegrelo (Mingrelia in Russian. Region of Western Georgia) and chess player from Georgia. Prince Dadiani was born in Zugdidi. He graduated from Heidelberg University Faculty of Law in 1873. Later, he served as a lieutenant-general of the Russian army. He had played at Paris, Rome, Kiev and Tbilisi tournaments before he won Petersburg amateur chess tournament in 1881-1882. He was the president of the 1903-1904 Monte Carlo international tournaments and according to the common, though unreliable believes, invited chess master Tchigorin to play but later paid him 1,500 francs (greater than 3rd prize money) not to play because Tchigorin had published analysis of one of the Prince�s games, pointing out he had made gross errors. A valuable art object was to go to the winner of a short match between the 1st and 2nd place finishers (Tarrasch and Maroczy). The players wanted a play for money also. This annoyed the Prince who gave the art object to the 3rd place finisher (Pillsbury). 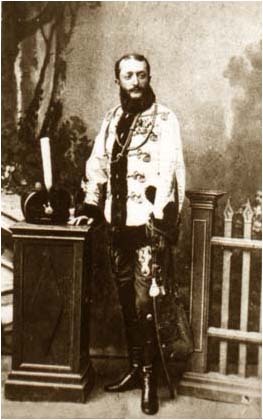 In 1887, Prince Dadiani-Mingrelski was a Russian candidate for the Bulgarian crown. This article is based on the article Andria Dadiani from the free encyclopaedia Wikipedia and stands under the GNU-Licence for free documentation. In the Wikipedia a list of the authors is available.